﻿ Nellie's Women's Shelter is looking for a few generous people to help get the women and children it serves moving - on two wheels. 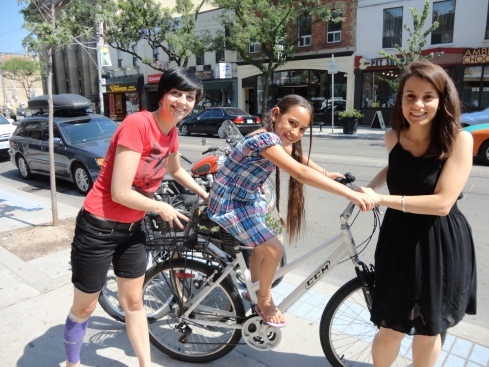 This summer, the east-end shelter put out a call for the donation of gently used bicycles as well as helmets, locks, bells and lights to help its clients get around town easier. Meghan Hogg, a counsellor and advocate at the shelter, serves as the new program's coordinator. "Transportation is always a huge issue for the women (and children at Nellie's). The TTC is so expensive now," said the avid cyclist, adding the lack of affordable, reliable and efficient transportation is a major hindrance for those needing to attend job interviews and other appointments. It can also be very isolating, she added. Earlier this year, Hogg started talking to her friends and contacts about the initiative. Before long, donations began rolling in as people gifted extra bikes and gear they no longer wanted or needed to the Riverdale-area organization. Hogg also posted about the initiative on various social media websites, which brought in some donations. With that success, Nellie's officially launched its new bike program this summer. "I think it's a good way for women to be able to get out of the house and the physical activity is always good," she said, adding Nellie's is looking to get a bike rack donated to the shelter as it would take far too long to get the city to pay for it. 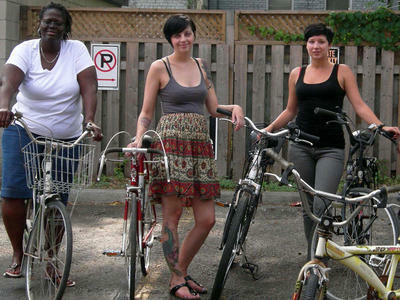 This summer, Nellie's hopes to collect five women's bikes, 15 children's bikes and 35 locks, helmets, bells and lights. Cash donations are also appreciated and tax receipts are available. Also, Nellie's is currently working on forming partnerships with local bike repair businesses to help mitigate the cost to repair donated bikes and equipment in "rough shape." Hogg, who said bikes in good working order are especially appreciated, hinted it would be extra helpful if the city stepped up to the plate and donated some memberships to its new Bixi bike rental program. The donated bikes and gear will be used by women and children at the shelter as well as by the kids in the shelter's summer camp program. Those who move out or those who don't live at the shelter, but seek assistance from Nellie's will be given the bikes and equipment. To make a donation, or for more information about the program, email meghan@nellies.org or call 416-461-0769. A Fish without a Bicycle?